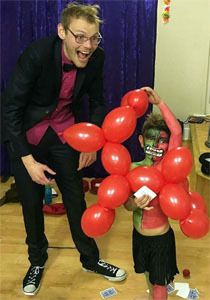 Incredible children's entertainer Chris enchants audiences with mind-blowing magic and illusion, hilarious family comedy and splendid storytelling.This is not just children's entertainment, it's FAMILY entertainment. 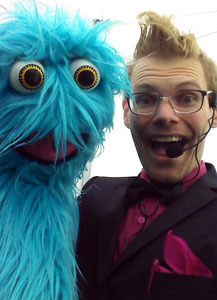 Chris also brings along his puppets Hercules the Wonder-Squirrel (who performs the world's most dangerous card trick) and the exceptionally naughty Ziggy whose jokes and songs will leave the children in stitches. 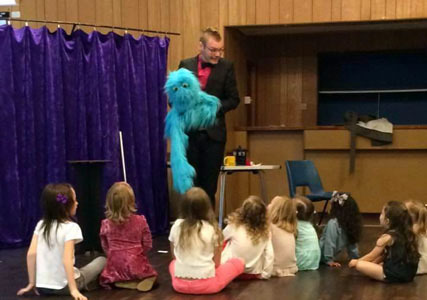 1) For one hour - Chris and his incredible puppets perform side-splitting comedy magic to blow your kid's minds (and the adults too!) with a bouncy backing track, astounding illusions and magic memories. 2) For an hour and a half - the one hour magic show as above plus, after a break for birthday lunch or tea, a 30 minute slot of super fun games - not just regular party games but actual entertaining gameshow where both the kids and adults are the contestants. 3) Two hours - A one and a half hour magic and balloon show, meaning EVERY child walks away with a balloon dog and this also calls for some hilarious antics with our inflatable friends. Following this Chris hosts 30 mins of awesome games. "Quick review of Chris - he was fab! We held a party at home for my daughters 6th birthday for 15 children, girls and boys, and they absolutely loved him! 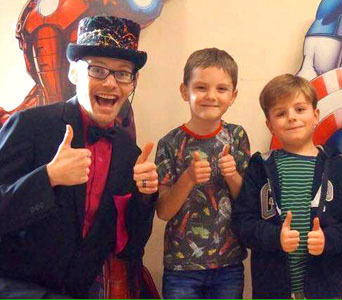 He kept them all engaged, amused and wowed with his magic and different characters, a real interactive show that the mums and dads enjoyed too! Great communication in the run up to the party, a lovely chap I wouldn't hesitate to recommend." "Chris entertained 30+ kiddies for my daughters 5th birthday party, ages ranging from 18months-6/7years and all I can say is WOW!! He did a fantastic job an capturing them all in the fun of magic. All the adults were very impressed too. Highly recommended and I will definitely be using him in the future Thank you for making Gracie-Rose's birthday one to remember." "Clearly invested in the attributes supporting his magic show to take the kids on a journey through the world of magic. Chris, thanks again. It was great. All the best - Bart"
"Chris put on an amazing show at my son's 5th birthday party. Lots of music, magic and madness - kept everyone entertained. Loved the puppets and even the adults were mystified by the tricks. Would highly recommend him." "We hired Chris for my son's 5th birthday party. He arrived on time and with no fuss at all. Communication before the party was great. He kept all the children entertained and my son who loves magic has been pretending to be Magic Chris ever since. A hit with him!! He also stayed to make the children balloon models which went down well. All in all money well spent. Thank you"
Thank you so much for today!! You were brilliant from the start til end!! So much energy and enthusiasm!! Teddy said you are the coolest magic man!! Thank you for making the party so special!! 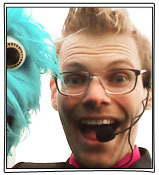 "Chris was amazing, he kept the kids entertained the whole time and when it was over they didn't want him to leave! Thank you!"